Home > Blog > How To Shift Your Marketing Team Into Data-Savvy Marketers? To stay competitive in today’s data-first world, everyone in your marketing department—marketing data analyst or not—should know how to analyze and interpret marketing data, from customer insights and performance figures to overall ROI. Marketing is at a crossroads, and now is the time for digital to stop monitoring and dive into data to extract more efficient tactics for targeting and spending. The marketing technology, cloud computing, and machine learning are expanding beyond the expectations and the face of marketing will change before you even know it. According to a recent survey by Econsultancy, two-thirds of marketers said their organizations do not yet have data analyst and data-related goals. The study showed that leading marketers who outperformed their KPIs appeared to have found a solution for achieving these results: Enable everyone on the team on how to be data-savvy. Nearly 60% of leaders say that in their organizations today, marketers get specialized training on how to use their data and analytics resources. Marketers are looking now at floods of real-time data that needs to be effective in consumer segmentation, content creation, and channel proliferation. Yet, the majority of the data are currently used for just monitoring and fixing nice looking monthly reports. The big issue is not about technology and tools under your hand, it is more about the human professionals who are creating paths for this data from demanding to analysis and decision making. The human capital skills are the most important factor in the data-driven marketing department. They are the ones who can research and decided which data is more important for the business. The more sophisticated the data you have the more dynamic your team should be. Your team should be data-savvy and data-driven in every step of strategy and execution. Over the years, I have been involved in the needs of CMOs and CEOs for reports that tell nothing, usually some traditional requests for traffic, organic and social media proofs which belong to the stone ages of digital marketing. This kind of directions can be misleading for the marketing department objectives since reports are more important for the marketers themselves. Top management should change their mentality and start learning more about the importance of data through attribution models and funnels. They should be more aware of how the proper insights from their team can change the whole assumption of consumer persona and strategy tactics. The marketing team should have two main skills, creative and analytical thinking. The old times of launching seasonal creative campaigns are already gone. Marketing now is more about science mixed with creativity. Every approach should be supported by insights, every project should have data analytics in the early stages, every achievement in KPIs should be identified by analysis, every single marketer of your team should be fully responsible with measuring and analyzing the data. Creativity will be always playing a key role in digital marketing, but with the right analysis in place, you are able to drive the creativity cart on the right track and adjust the budget allocation more sufficiently. For more information on this topic, check my previous article: How To Shift Your Marketing Team to Data Science and Marketing Technology? You will need to study your team structure and figure out their skills. Empower their skills with training modules on topics like data science, marketing technology, and automation trends. The team should master the use of CRM data, web analytics, sheets and charts. Don’t only rely on hiring data analyst who can do the magic. 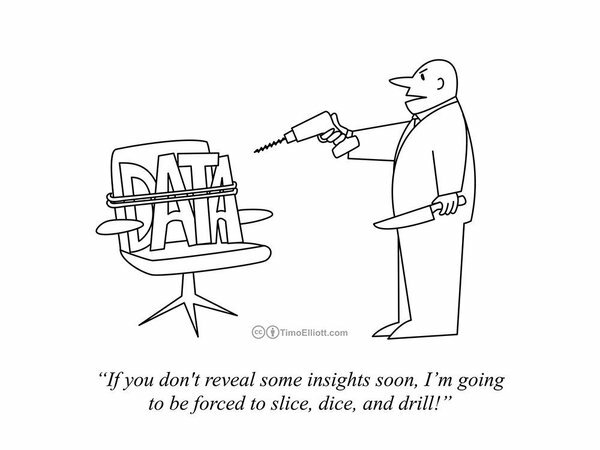 Your team should always have the skills of putting data insights into proper context and metrics. 75% of marketers agree that lack of training on data analytics is the biggest barrier to making more key business decisions based on data insights. Before dealing with your data, make sure it’s presentable. As they say, Good data is usable data, and that means it should be always real-time, organized, secure, and understandable. Establish clear definitions and KPI metrics so everyone in digital marketing team can speak the same language. Leaders are 33% more likely to say that their data analytics explains how the business defines and measures the consumer persona and touch points the online journey. According to the Econsultancy survey, standing out as a point of difference between leaders and laggards is an understanding of the customer journey across channels; while an astonishing 90% of all marketers believe that understanding the cross-channel experience is “critical to marketing success,” only 43% of the mainstream report having a “clear understanding of customers’ journeys across channels and devices,” compared to 64% of leaders. Set a baseline for knowledge requirements and analytics. Set proper timeframes that is effective for your business case and define the level of accuracy. Don’t just sail in the sea of tools and charts without a compass. With proper research, you can set the standards which the team should follow in their monitoring and reporting. From my experience, too much of reports is a misleading thing. It is better to define what you really need to make a decision or otherwise you will be overwhelmed with the lovely interactive charts that data platforms provide. I also recommend to acknowledge and reward the team members who apply effective tactics based on data insights while they launch their campaigns. Make sure you have the right technology needed to take action. To drive your marketing team towards a competitive edge in the market or among competitors, you need to select your technology and platforms wisely. Based on your needs from insights and automation, define which platform you should invest in. Don’t follow the tones of advertisements online and the on-going offers from software companies. A powerful solution is not based on the brand of the software, it more based on your needs and how effectively you are going to use it on daily bases. Your team should be always in the middle of every technology implemented. Arrange training for the whole team and get them always up-to-date with technology trends. Hire a marketing technologist in-house who can be always involved in researching an integration of technology. With these few tips, I believe you can have an overview of this mission. If you have a question or looking for marketing analytics consultant drop me a line and let’s discuss.